The City of Stratford says it has been the target of an apparent cyber-attack, but officials do not believe personal information was compromised. The city northeast of London first acknowledged the incident in a Sunday night Facebook post. 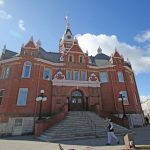 Stratford Mayor Dan Mathieson said Monday they’ve determined it was a ransomware attack, but IT staff has “found no evidence of data theft or transfer.” He added the city is currently working with security experts and law enforcement agencies on how best to proceed. Stratford police Const. Darren Fischer said they’re investigating the issue. “Looking into how it originated, who could be responsible for it,” he said. Mathieson said he wasn’t aware of a recent cyber attack on the city, but acknowledged it’s becoming a widespread issue across the country. Compudata can help you prevent Ransomware! To learn more about our security services, reach out to us at 1-855-405-8889.